Okay this has been going on long enough and I have avoided bringing it up only because I have considered it low priority with all the other issues out there with the game. I have 9 planes that have a syntax error or missplacement along with a few other verbage lines in the hangar. In addition all the tasks for getting the Vamire are non-readable. It would be nice if you could get a developer to identify and correct the issue. 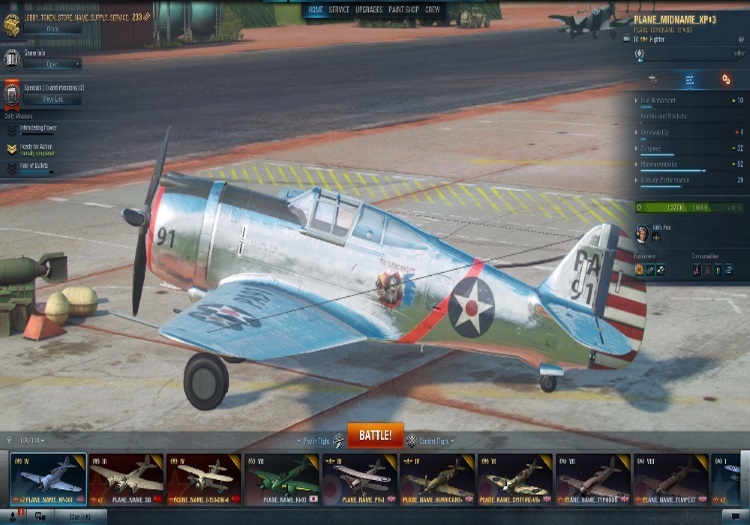 I have attache a hangar shot with all 9 of my planes that have the issue. 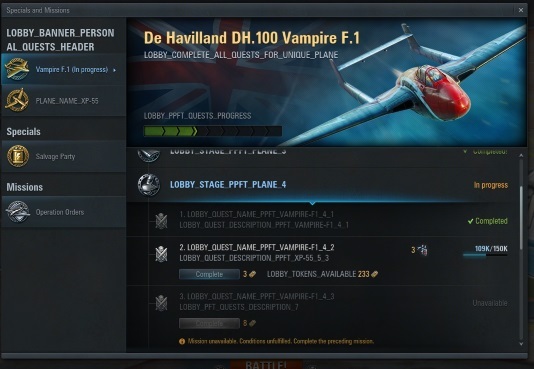 Now I know that it has not been an issue with all new planes because I have a number of recent planes that I have won that do not have this issue. Thank you from the deepest part of my heart which I do not have. PS: If there are any pilots out there that know how to fix this issue without begging and pleading with WG please let me know. This is caused by mods. Load the game in safe mod - everything will be fine. Or remove files from res_mods directory. Are you using the Who's the AI Bots mod? Every time that there is a minor or major, the file that is modded to put an * next to bots names has to be updated or you will get the issue that you see on screen that you are showing in your picture. If not the mod, run the repair option from the game launcher. yes I use safe mod to read the documentaion on the tasks but I do not want to do that nor should I have to. If the programers would get the syntax the same on all planes the issue would be gone!!! The question becomes why can't they follow the programing documentation for all planes?? I am sorry gents you are trying to help out but the issue is not that I use mods but the fact that they can not get the programing correct!!!! I am in a pissy mood right now... ... ... oh no another banned word I am doomed to the bot banned world!!!!! Well, duh! What else to do when BSoD? A sadly ever more frequent event. It is an issue caused by mods, it is not a bug. DrSinister is absolutely correct: using mods adapted for the previous version of the game client will surely cause issues, so make sure you keep the mods updated for the current game version. so what Mods are approved for the current game???? We do not approve mods or have lists of them. Updating mods is on the mod-maker side, when they update their mods they usually leave message like this one defining the number of game version this mod is adjusted to. Thank You Dr Sinister, after you informative comments I was able to utilize a mod pack and get my personal mods in and it is now working just fine. You are an awsome individual and pilot despite what ZapperGuy says!!! Lol, not being picky, but I got in trouble for using the word 'verbage' in an essay. According to our English teacher - there is no such word. The correct word is verbiage and it means 'excessively lengthy or technical speech or writing' (except in the USA, where it means 'the way in which something is expressed').